A 52% reduction in lighting costs provides total project payback of less than one year. Many companies today are taking steps to become more energy efficient, both to respect the environment as well as to control operating costs. And for Sparrow Enterprises, a Boston-based importer and distributor of chocolate and other items for use in the baking, confectionary and ice cream/dairy industries, product safety is also of critical importance. For cold storage operations, ThinkLite LED tubes are rated to operate at temperatures as low as -30F. And, because only ThinkLite offers a driverless tube design, these products generate only about 10% of the heat of a traditional LED, putting less of a strain on the HVAC system, which translates to even further savings on cooling. This additional savings derived from the HVAC can contribute a further 30% reduction on energy costs than projected in cool storage facilities. ThinkLite’s breakthrough technology retrofits into existing fixtures, eliminating the need to replace and discard old fixtures. “We were especially pleased that our existing fixtures, which were very serviceable, did not need to be replaced. That’s saved significant dollars while eliminating the waste of discarded fixtures,” said Bride. Importantly, a major advantage for the food distributor is that they could finally get rid of the light sleeves that are commonly used to cover fluorescent lamps due to their mercury content and ease of shattering. Maintaining fluorescent sleeves as they frequently yellow or purchasing shatter proof fluorescent lamps at four times the cost only worsens the objective of low operating costs and long term efficiency. ThinkLite, 2015’s Inc. Magazine’s top “Under 30” company, designs, manufactures and distributes its own lighting products including the industry’s first ‘driverless’ LED tube, a breakthrough that improves light quality at an industry leading 131 lumens per watt. As well, ThinkLite driverless lamps operate cooler than traditional LED, extending each lamp’s life to 65,000 hours, or a projected 10 years. 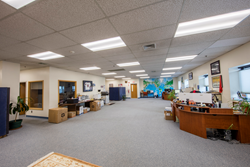 The project scope for Sparrow Enterprises included replacing existing T8/T12 fluorescent tubes with ThinkLite tubes, resulting in an annual kilowatt (kWh) hour reduction of 52%. And with a ten-year lifespan, costs associated with replacing lamps and ballasts (bypassed by the ThinkLite solution), the overall savings are significantly improved. ThinkLite also secured a sizable cash incentive rebate from Sparrow’s utility company, resulting in significant overall cost reduction as well as a payback period less than a year an annualized ROI of 125%. “To have a project be cash flow positive from the start, coupled with significant overall savings, a sizable reduction in energy consumption as well as supporting our desire to be ‘good stewards of the land’, going with ThinkLite was a great decision. “ said Bride. Henry Baybutt, Sparrow’s President summed it up by saying, “We believe the ThinkLite solution to be the best available today. Not only are we saving, but also aesthetically, you can’t beat ThinkLite. These LED tubes generate outstanding light quality, energizing the workplace and empowering our entire team. An improved atmosphere makes the environment brighter and safer for all.